Don’t bring teaching materials to Africa—bring ideas. That’s the motto a team of volunteer Canadian teachers lived by when we signed on to co-lead methodology workshops in east Africa in July. We were part of “Education Beyond Borders,” a non-profit organization endorsed by the BCTF. EBB is all about sustainability according to its founder, West Vancouver secondary school teacher Noble Kelly. That’s because African teachers continue meeting and supporting each others’ best teaching practices after the Canadians leave. Empowering teachers and supporting quality education has proven more sustainable than building schools or providing teaching supplies, EBB asserts. 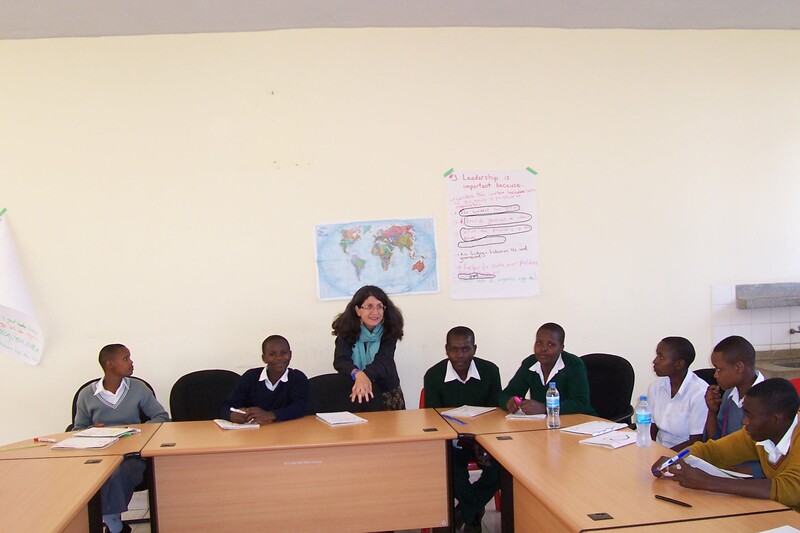 Since its beginning, the teacher-led organization has volunteered in South Africa, Kenya, and Tanzania. Our team arrived in Arusha, a tourist destination in northern Tanzania, in early July. Among Africa’s most politically stable democracies, this country is also among the world’s poorest. BC educators included this writer as well as Lisa Toffolo, Shannon Howlett, and Carolin Rekar Munro. We were joined by Anita Hayhoe, an Ontario teacher, along with Katharine Kan (BC) and Maureen Hillman (Quebec) who would later travel to Kenya. After acclimatizing to the cooler high altitude, tropical vegetation, and dusty roads, we met with our Tanzanian co-facilitators, Edward Lolusu, Wilson Mollel, Jesse Laizer, Thobia Gonelimali, Fides Sharima, and Ndensary Massawe. They had taken EBB workshops the previous summer and were eager to pass on new teaching ideas to 200 primary and elementary school teachers. Our Canada-Tanzania facilitator team met over three days at Arusha Community College to collaborate on how we would “show” not just “tell” teachers about progressive teaching methodologies. The greater goal was to encourage Tanzanians to shift from teacher-centered lecturing to more effective student-centered instruction. Afterwards we travelled to the village of King’ora, about a two-hour drive from Arusha, staying in a church-run guest house. We walked to classes each day, sharing the dirt road with the occasional stray goat, a snow-capped Mount Kilimanjaro always in our sights. Local residents and shopkeepers—from the butcher to the tailor—exchanged friendly greetings in Swahili. We were quick to move aside when a motorcyclist or bus, crowded with working people, sped by. We eventually approached a soccer field and then the Knowledge and Cultural Centre, where we held our sessions. Our work as facilitators involved teaching collaborative and inquiry-based learning strategies to participants, equally young and old, male and female. These teachers worked in primary and secondary schools in the rural districts of Leguruki and Ngarenanyuki, some enduring more than three-hour bus rides each way to participate. They were given paid release time and EBB covered meals and transportation costs. Assisting admirably with the logistics were Ndekimi Urio, the ward education officer and Kassim Mussa, cluster education officer—as well as our Canadian co-team leaders Shannon and Anita. Despite membership in a trade union, teachers here are poorly paid. They teach 70 to 100 students in both primary and secondary classrooms with few textbooks. The government assigns work posts, which means new teachers are often in remote areas. Hardship pay is not recognized by the government either. Professional development for teachers is rarely offered. Most profound is the language issue in Tanzania schools. In these post-colonial decades, Swahili and English are the national languages, although the first language for students is a tribal tongue. Primary schools are taught in Swahili, secondary in English, with Form 7 (equivalent to our Grade 8) the transition year. Not surprisingly, a huge drop-out rate occurs as students struggle to make the language transition. Many of those who stay in secondary school, fail their final exams. Teachers and students are blamed—not the system. We began each day with icebreakers, after explaining the term to our equator-dwelling colleagues. These ranged from pair and share activities to an EBB chant/game. Fun in the classroom, we demonstrated, is allowed. But we also appreciated the need for classroom management and introduced the liberal notion of a “community agreement,” in a country that still employs corporal punishment. We proposed that learners and teacher work together to come up with rules in the classroom and post them. In this teacher workshop, turning off cell phones was the number one rule. “No unnecessary movements” appeared to be a top concern teachers told us they raised, when handling students. As we counted off teachers into groups and gave out tasks using the placemat, jigsaw, and gallery walk methods, (examples to follow) we talked about the benefits of collaborative learning. In small groups our students learn from each other, we proposed, rather than constantly listening to the teacher lecturing whether it’s working on a chapter in a textbook or tackling high-level questions. This wasn’t disputed by our Tanzanian colleagues (it saves the teachers’ energy, one participant wisely noted) but what was difficult, they told us, was using this method with more than 70 students in a 40-minute lesson. We also learned a lot about our colleagues’ family and teaching life during chai and lunch breaks. And we learned about their diet as we ate food together, cooked by local women. This included huge potato fries, plantain stew, sweet yams, beans, rice, and small pieces of meat, eaten with a toothpick! Teachers tried the new methods in their classroom and reported back at a final workshop. Suggestions included: don’t give up—it takes time to try new ideas; select student leaders to circulate to ensure groups are on task; ensure students in groups are assigned roles (recorder, speaker, etc.) and finally, where space is an issue, groups can work outside. Bloom’s Taxonomy, a “pyramid” concept taught in teacher training (also familiar to Tanzanian teachers) was discussed as we encouraged teachers to engage in inquiry-based learning with their students. We reviewed three levels of questions. At the pyramid base, “low” questions (factual), next medium-level questions, and finally high-level questions that can lead to many answers. Teachers formed groups and formulated questions on an assigned topic at each level of the pyramid, with an overarching “essential” question at the very peak. In the process we learned a lot about issues affecting Tanzania, from hygiene to family planning (subjects taught in their schools) to police and court abuses and political corruption. A good classroom lesson is akin to reading a good story. The lesson has a “hook” (such as an essential question), content, and a summing up. We illustrated a closing activity with the teacher tossing a ball at a student who is required to answer a question such as “What was one thing you learned in this lesson?” On our final day in the village, we had an opportunity to visit primary and secondary schools to see some of these ideas in action. Thobias was teaching civics using the jigsaw method when we arrived at his school. His class of 70 students was already in groups, each with only three textbooks to share. We circulated and listened to students discuss equality, fairness, and the basic rights of citizens, later reporting out to the class. In a smaller science class conducted by Fides, groups of students were given a “placemat”—a sheet of paper prepared by the teacher, with a question written in the centre and lines drawn outward into fifths. Each student came up with their own answer, then shared with their group, and then the class. It was a bumpy ride along unpaved roads back to Arusha for our Canadian team—not unlike the educational path Tanzanian teachers confront. We hope our ideas and moral support go further than material resources ever could. Certainly back in our classrooms in Canada, we will gain a stronger perspective on global education. More heartfelt is our discovery of a small piece of Africa where we made good friends. On a sunny Saturday, 20 students travelled from rural Tanzania to the city of Arusha for a one-day leadership conference at Arusha Technical College. It was an opportunity to encourage leadership skills and ask young people about their dreams. If their destinies are anything like their names—these young people are in for a good future. Two female teens are named Happiness, one male is named Fabiola, (close enough to ‘Fabulous’) and two other males go by the common name Baraka. (And yes, Barack Obama is on the list of admired leaders here.) Some names are biblical too like Withness and Godlisten. Given the hard realities of life, Tanzanian youth already have many responsibilities within their family, at school, and in the community. We received many insightful ideas from participants. In a “gallery walk” activity we asked students to form groups and write down the qualities of a good leader. We then posted the results and groups moved around the room (as in an art gallery walk) and observed the various responses. “No corruption” was top of the list—this from young citizens of a country frequently in the global spotlight on corruption charges. The Killarney Secondary School Environment Club in Vancouver donated money they fundraised toward hosting this leadership conference. As we mentioned this to participants, we learned many were involved in their school’s environment club too. Tanzanian students dig up small trees in the forest and replant them in desolate areas, we learned, combating deforestation. They discuss topics within their clubs ranging from global warming to poaching of animals. (There are lots of bumper stickers in Arusha condemning poaching—but also safari companies that still take out foreign hunters.) These students also identified overgrazing, lack of recycling, industrial pollution and loss of biodiversity as some of the key environmental issues they are dealing with. We encouraged students to dream—for themselves and their community—through journaling activities. The action-packed day also included an inspirational talk by Lazario, the student president of Arusha Technical College, and a tour of the many facets of the campus. As the students boarded their bus back to their rural homes, we bid them farewell with a great sense of faith in the future of Tanzania. Reprinted from BC Teacher newsmagazine, October, 2014. Watch for an article I have written on the topic of overseas teaching and sustainability in the upcoming issue of Our Schools, Our Selves.